The International Marriott Hotel Group has created a luxury Hotel & Spa plus a Championship 18-hole golf course on 200 hectares of beach front land near Óbidos. Online Discount. The International Marriott Hotel Group has created a luxury Hotel & Spa plus a Championship 18-hole golf course on 200 hectares of beachfront land near Óbidos in Portugal. 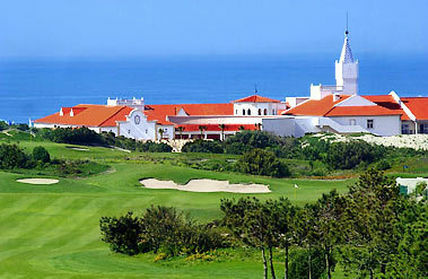 The Praia D'El Rey Golf & Beach Resort is located approximately 40 minutes drive from Lisbon Airport (75 Kms). The Hotel has 179 rooms which includes its suites and is only three floors high All are very comfortably furnished and have those extras to be expected of a 5 star Hotel. There are non-smoking rooms and also rooms for the disabled. The 'Atlantic Grill' restaurant serves an international cuisine and buffet, and the 'Romy' restaurant specialises in a gourmet Mediterranean cuisine with an emphasis on fresh seafood. There are two bars, snooker and table tennis. Outside there is the beach (only 50 metres distance), gardens, 7 floodlit tennis courts and club, a football pitch, and parking area. The 18-hole golf course is Par 72 and 6.045 metres in length with a Club House and its own bar and restaurant. It has been elected within the top 100 Golf Courses in the World and 13th in Europe. The deluxe Spa and Salon are fitted with a range of treatments to help sustain the body’s well-being. Soothe aching muscles and joints inside the heated saunas and steam baths, or, maintain your health by taking advantage of our well equipped gymnasium. The Spa offers a variety of onsite features which include an indoor and outdoor heated swimming pools, Jacuzzi, saunas and steam baths, soothing Vichy shower and massage rooms. Besides being a natural choice for golfers the Hotel makes a practical base for guests wishing to explore the many attractive and interesting locations in the area. The nearby medieval town of Óbidos is a 'must'. Further a field there are Caldas da Rainha, Alcobaça and Peniche, the later with the famous Berlenga Islands lying offshore.